A modern military museum which uses computers, DVD presentations and creative displays to tell the stories of courage, humour, tradition and sacrifice of those who served in the regiments of Devon and Dorset for over 300 years. The uniforms, weapons and medals all bear silent witness to those of a bygone age and of more recent conflicts. The diversity of articles on display allows the imagination to recreate the world of these soldiers and their families from 1685 to the present day. An added bonus is the spectacular view from the battlements of Dorchester and surrounding countryside brought to life in the novels of Thomas Hardy. The museum is housed in The Keep, a Grade II listed building. 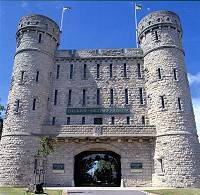 It was built as the gateway to the former barracks of the Dorsetshire Regiment in the 1870s. In the building were the guardroom, cells and the armoury. Today it has been modernised into a state-of-the-art military museum retaining many of the original features, including one of the cells. New extended third floor gallery commemorating the Devonshire and Dorset Regiment 1958 - 2008. We are unable to admit unaccompanied children under the age of 12.